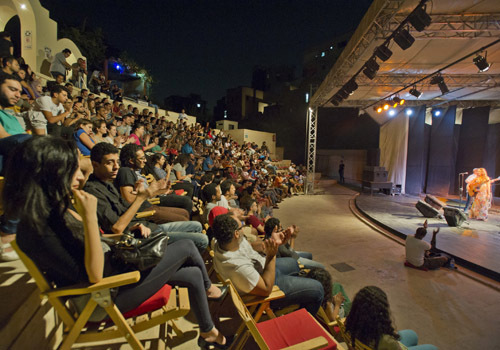 Nawel Ben Kraiem travels from France to Cairo for a performance at the Hayy Festival, energising audiences in a politically turbulent time – Originally published in Ahram Online. With her charming smile, radiating energy and compelling stage presence, Tunisia’s Nawel Ben Kraiem took to El-Geneina’s stage on Thursday 25 July. She brought audiences to their feet, dancing and clapping along to the beats of her electro-rock music with a hint of Tunisian folklore. Ben Kraiem started the night with a traditional song with a pop arrangement about a Tunisian woman who is in love with a Dutch man during the French colonisation of Tunisia. “He is a double enemy of French and Tunisian people,” Ben Kraiem told Ahram Online before the show. “It is about that irrational feeling, when you’re not allowed to feel something but you feel it anyway,” she explained. Her music is inspired by real-life stories, socio-political issues and sometimes from abstract dreams or thoughts. Upon starting her second song of the evening in both French and Arabic dedicated to the Tunisian revolution, ‘Ya Tunis’, Ben Kraiem offered her condolences to slain Tunisian opposition political Mohamed Brahmi, who was killed earlier that day. “Bless all the martyrs of the Arab revolutions,” she said. ‘Ya Tunis’ is a revolutionary song about the euphoric feeling that something is not totally under control, something that is powerful, but makes one afraid at the same time. On revolutions where seemingly the oppressor is gone, and people are happy, but the repercussions are more complicated than that. Many of Nawel’s songs discuss socio-political issues. ‘Refugee’ is about immigration and the view that that grass would be greener on the other side. ‘Revolution’ is about breaking past personal limits not political ones. One of Nawel’s most interesting songs is ‘Safsari’, which has an official video clip. Safsari is about the Islamisation of Tunisian society where women started wearing the veil around ten years ago. “Safsari is the traditional Tunisian scarf that many women used to wear for cultural reasons, which was replaced by the traditional religious scarf,” she explained. “It is a message that we forgot our identity and culture, we have to be careful not to let our culture be dominated,” she added. When Nawel arrived in France, she did not find herself in French theatre, so she started writing poems to express herself and found it to be the way she felt most comfortable. “It’s easier because with music you don’t need to be in a company or something like this. You can just take your guitar and go to a bar,” which is what she started doing in Toulouse, then Paris. “Four years after starting in France, I had my first opportunity to sing in Tunisia where I found the point which links art to society and using it to ask political questions,” she said. In France, Nawel joined several bands, first Cirus who played acoustic music, then Earned Blossom which was a French-Mexican band which played electronic music with Arabic lyrics. “It was very interesting but they had a very clear idea of their artistic direction,” she said, emphasising that she was looking for a different sound and an open canvas to come up with her own project. Both endeavours played a great role in her development as an artist through working with talented people, travelling, performing and meeting different artists across the scene. Interested in the fusion of electronic and Arabic music since a young age, Nawel formed her own band (which she performs with now,) consisting of a nayist, guitarist, bassist and drummer. In light of the current political situation in Egypt and Tunisia, where both societies are polarised and there is a constant battle between liberal and Islamist ideologies, one had to ask Nawel for her view on the role of the arts in these turbulent times. “I think some extremists do not want that possibility,” she added. On a personal level Nawel does not like to be aggressive with Islamist extremists in her art, regardless of her personal views.